Main Site → About Apple → History of Apple → What Intel Processor Do You Have in Your Computer? 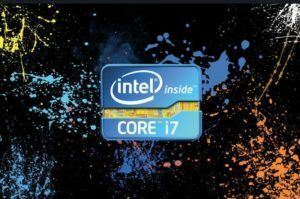 What Intel Processor Do You Have in Your Computer? Intel corporation is the leading developer and manufacturer of desktop and mobile Intel processors. They sell their products to Apple, IBM, Dell, Samsung, Sony and many other vendors. Intel processors, like people, have a family and different generations. In order to differentiate them, identifiers such as brand names, generation and critical characteristics have been invented. The first identifiers were quite simple: brand name, plus a number. For example, the Intel Atom 330 or Intel Atom N270. The N letter is called a prefix, (or alpha prefix) and defines the processors usage: either on desktop, or on mobile systems. The higher the number, the more features the processor had. As Intel processors became more and more complicated, their identifiers also followed suit. Intel Core, or Intel Core 2 Duo. Sometimes, online vendors add the architecture brand name such as Sandy Bridge, Ivy Bridge, Haswell or Broadwell. Following the brand name, there is also a letter or an alpha prefix, followed by four or more digits as well as more letters or suffixes. Obviously, these letters stand for crucial features of the processor identified. For instance, M identifies mobile processors designed for laptops, net-tops or tablets. X stands for an extreme edition, Q – for quad core, L – for low-energy processors and K – for unlocked processors, which are deliberately designed for overclocking. The list of possibilities is extensive, so we advise you to consult the manufacturer’s website, Intel.com in each specific case. This guide’s goal is just to give you some general outlines. So, in this example, we have Intel Core i7 processor of 3rd generation, mobile extreme edition. If you find this processor in a desktop, think twice before buying it, because the mobile processors have limitations to their performance. If you look for a home server or cloud, you should look for processors with T or L in their identifiers, where L means a low-energy processor and T – a ‘cold’ processor that doesn’t get too warm under performance. Intel Corporation is an American, multinational corporation and technology company, headquartered in Santa Clara, California. It was founded by Gordon Moore and Robert Noyce on July 18, 1968. Its name was conceived as a portmanteau of the words integrated and electronics. The intel corporation is the world’s largest and highest valued semiconductor chip maker based on revenue, and is also the inventor of the x86 series of microprocessors: the processors found in most personal computers (PCs). Intel supplies processors for computer system manufacturers such as Apple, Lenovo (formerly IBM), HP, and Dell. Intel Corporation manufactures motherboard chipsets, network interface controllers as well as integrated circuits, flash memory, graphic chips, embedded processors and other devices related to communications and computing. The Corporation was founded by semiconductor pioneers, Robert Noyce and Gordon Moore. The company is also widely associated with the executive leadership and vision of Andrew Grove. Intel was an early developer of SRAM and DRAM memory chips, which represented the majority of its business until 1981. Although Intel created the world’s first commercial microprocessor chip in 1971, it was not until the success of the personal computer (PC) that this became its primary business. During the 1990s, Intel invested heavily in new microprocessor designs, fostering the rapid growth of the computer industry. It thus became the dominant supplier of microprocessors for PCs and was known for aggressive and anti-competitive tactics in both defense of its market position, (particularly against Advanced Micro Devices or, AMD) as well as a struggle with Microsoft for control over the direction of the PC industry. The Intel Corporation has a significant participation in the open source communities since 1999. For example, in 2006 Intel released MIT-licensed X.org drivers for their integrated graphic cards of the i965 family of chipsets. Intel released FreeBSD drivers for some networking cards, available under a BSD-compatible license, which were also ported to OpenBSD. Binary firmware files for non-wireless Ethernet devices were also released under a BSD license, allowing free redistribution. Intel ran the Moblin project until April 23, 2009, when they handed the project over to the Linux Foundation. Intel also runs the LessWatts.org campaigns. After the release of the wireless products called Intel Pro/Wireless 2100, 2200BG/2225BG/2915ABG and 3945ABG in 2005, Intel was criticized for not granting free redistribution rights for the firmware that must be included in the operating system for the wireless devices to operate. As a result of this, Intel became a target of campaigns to allow free operating systems to include binary firmware on terms acceptable to the open source community. Linspire-Linux creator Michael Robertson outlined the difficult position that Intel was in, if they released to open source. Intel did not want to upset their large customer Microsoft with any decision made. Theo de Raadt of OpenBSD also claimed that Intel was an “Open Source fraud”, after an Intel employee presented a distorted view of the situation at an open-source conference. In spite of the significant negative attention Intel received as a result of the wireless dealings, the binary firmware still has not gained a license compatible with free software principles. Have you checked out our prices recently? Remember, the possibility to trade in your old device for top dollar cash is just a click away : Make smart decisions about your money! We at iGotOffer.com pay the best price online! : Sell old computer online for top dollar now!